Washington (CNN) - Seven in ten Americans support military action by the U.S. and other countries to establish a no-fly zone in Libya, a 14-point increase since last week, according to a new national poll. But a CNN/Opinon Research Corporation survey also indicates there is less among the public for air strikes that directly target Libyan leader Moammar Gadhafi's troops who are fighting opposition forces, and only one in four want to send ground forces into the conflict. The poll was conducted Friday through Sunday, both before and after military action against Libya began on Saturday. But there is no indication in the data that opinions on Libya changed on Saturday or Sunday as a result of the air strikes. 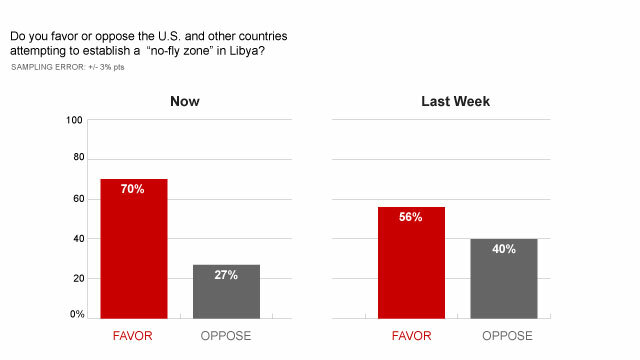 According to the survey, 70 percent support the establishment of a no-fly zone by the U.S. and other countries, up from 56 percent a week ago. Twenty-seven percent oppose the move, down 13 points. The poll indicates support drops to 54 percent for air strikes not directly related to the no-fly zone that instead target the troops fighting the rebels, with 43 percent opposed to that action. And most Americans are on the same page as President Barack Obama in opposing putting U.S. ground forces into the conflict. Seven out of ten questioned oppose such a move, with just 28 percent in favor. The survey indicates a bit of a partisan divide and gender gap over a no-fly zone and attacks on Gadhafi's forces. "Republicans are somewhat more likely to support the no-fly zone than Independents and Democrats and are significantly more likely to support air strikes unrelated to the no-fly zone," says CNN Polling Director Keating Holland. "Men are also more willing to support military action than women - a common pattern in American public opinion." week to 34 percent now. "But that's far less than the number who thought it was very important to oust Saddam Hussein from power in the run-up to the Iraq war in 2002. It's also less than the 44 percent who say that it is very important for the U.S. to protect Libyan civilians from Gadhafi's forces, indicating that public support for military action in Libya has more to do with humanitarian concerns than a desire for regime change," adds Holland. Seven in ten Americans are confident that the U.S. will be successful in protecting civilians from Gadhafi's forces and three-quarters think that Gadhafi will be removed from power. But only 55 percent think the U.S. will be able to accomplish its goals without sending in ground troops. Half of those questioned approve of how the president is handling the situation in Libya, with 41 percent saying they disapprove, and a relatively high nine percent undecided. Only 27 percent of Republicans approve of how Obama is handling Libya despite the fact that they are more likely than Democrats and Independents to support the military strikes that began on Saturday. "One reason: only three in ten Republican say they trust Obama as commander in chief, compared to 82 percent of Democrats and 52 percent of independents," says Holland. The CNN/Opinion Research Corporation survey was conducted by telephone, with 1,012 people questioned. The survey's overall sampling error is plus or minus three percentage points. So most Republicans don't approve of how Obama is handling it, despite him doing what they say they want to see done? Oh hypocrisy, Republican is thy name. President Obama did the right thing to wait for UN to lead the collision thus empowering what the WORLD needs now and in the future a United Nations approach to first genocide I'n any global community and other emergencies. The USA will always have the most power and means but must let others lead even on the ground if necessary. We can all agree no world leader can be allowed genocide of their people. We must stand together as one World Government. This is our big chance to do it right. A heck of a lot if Americans would have supported a no-fly zone over Gaza and Lebanon but Israel's AIPAC runs the USA Govt. Most people don't know anything about Military Strategies and are unaware that if you don't cut the head off the snake then it will live to kill another day. Would you want someone in your family to die because the USA did't finish the job. I do not agree a no fly zone in Libya for a couple of reasons. If the world is sick and tired of President Gadhafi it should be the responsibility of the people of Libya to get rid of him as they did in Tunisia or Egypt. The who idea that he is massacring his people and not accuse the other side for trying to massacre the supporters of the president. I do want you to think I am advocating an eye for an eye. but I am merely elaborating that one side is not going to stand still when the other side is trying to take out. The no fly zone to me it's only aim is to help the other side get advantage , cripple the ground forces and give the opposition the cover to advance and overthrow the president. The United Nations made a big mistake to allow a no fly zone without clear clarification/ agenda what the final outcome will be. The political problems in Africa is not easy to solve for the basic reasons you have tribal divisions, tribal dominance, some kind of economic ties and the presidents of those countries are supported by the same people that are trying to help the opposition topple there governments. A good example is president of Egypt who we supported for years, a friend of our country but when thinks turn to the worst we were the first once to ask him to step down and the media started calling him a dictator. Where were we when all these was going for years. I hope the no fly zone plan works so as a consequence of its failure to achieve its target it will not create a long time instability in Libya. I understand things need to change, people should be heard but asking to establish a free society/ democracy is a a hard sell in Africa because of the political, tribal and religious framework of the continent as a whole. Polls do not mean a thing because the average person most probably do not know were Libya is and who is its president. The goal of the United Nations should have been discussed with the Arab League and The OAU because it is a functioning body that has a say in African politics. I hope there will be a better solution than bombarding from the air, not creating an advantage for one side and in turn create an all out war that will put the country in Desiree. The United Nations should also open its eye to the miseries on internal conflicts that is going on around the world and not spend most of its time meddling in other countries political affairs. Obama is so slow. This should have been done weeks ago. Well this is what happen when you have an incompitant pres. I think the President has been 100% correct on the Libya situation. He asked the opinions of his top advisers; made sure we had a consensus of the security council; the support of Arab countries; no ground troops. Good timing, great leadership. I suppose these idiots would also pay for this illegal war by cutting more wages and benefits from unions......or better still just don't pay for it all. After all deficits don't matter when there are war profits to be made or multi national corporate oil companies to protect! While i support this, I do not want to see it escalate and become anouther Iraq or Afghanistan. The Bosnia model is good. It appears that the President is being cautious. This is wise. "Its not about oil its humanitarian"
"Its ok to bomb people as long as you don't use troops"
"We should be cutting our defense budget not social programs"
To be fair, I do agree with the No Fly Zone enforcement, although I feel it came far too late. It was a mistake to let Gadhafi's forces slaughter for weeks before forming any response. In Obama's speach on the 18th "Indeed, our British and French allies, and members of the Arab League, have already committed to take a leadership role in the enforcement of this resolution, just as they were instrumental in pursuing it. " Frankly, I just don't see this occurring. It's become quite clear that the US is in the lead here. The overwhelming amount of assets used in the strikes are American. I've seen reports from The British and French, but nothing at all from the Arab countries. This appears to be in contention with Obama's statement. Obama's liberal base is in shambles over this. To be fair, Film director Michael Moore is at least consistent, by blasting Obama over the US involvement. Personally I think the man is a lunatic, but then again I also think the double standard of the liberals is just as bad. Of course we don't support targeting Gadhafi himself: he is a human being entitled to (God-given) personal respect, and in this country he would also be entitled to social services such as medical care, housing, and food. We are simply protecting the Libyan citizens that Gadhafi rules and wants to kill. Now if it happens that a stray missile takes out a Leader who is in harm's way, that would be a shame, but I could submit to a higher will and accept the reality of Gadhafi's death. Now what was the number of that flight where he ordered that poor sick fellow to put the bomb?